Spirulina, also known as blue green algae, is one of the oldest living organisms on earth. It is over three billion years old and one of nature's most nutritious super-foods. 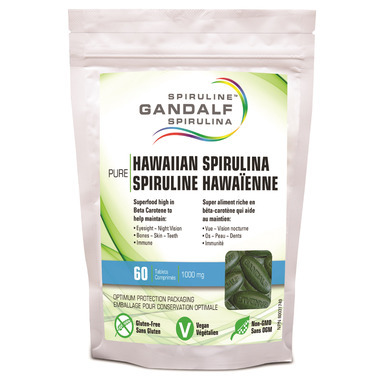 Providing support to almost every organ in your body, adding Gandalf Hawaiian Spirulina to your diet is the smart thing to do! It provides you with an energy boost, supports your immune system and so much more! Source of beta-carotene, a provitamin A, for the maintenance of good health. Source of beta-carotene, a provitamin A, to help maintain eyesight, skin, membranes and immune function. Source of beta-carotene, a provitamin A, to help in the development and maintenance of night vision. Source of beta-carotene, a provitamin A, to help in the development and maintenance of bones and teeth. Source of iron for the maintenance of good health. Source of iron which helps to form red blood cells and helps in their proper function. Source of protein for the maintenance of good health. Source of protein which helps build and repair body tissues. Source of (an) essential amino acid(s) for the maintenance of good health. Source of (an) (essential) amino acid(s) involved in muscle protein synthesis. Adults: 1 - 5 Tablet(s) once per day. Start by taking 1 tablet daily, with fruit, and then increase gradually to 5 tablets, or as directed by your health care practitioner. Drink plenty of water. Store in a cool, dry, dark area. This Spirulina is dried in an oxygen-free environment (less than 1%) helping to preserve its original nutrient value and is free from chemicals, pesticides and is non-GMO. Consult a health care practitioner prior to use if you are pregnant or breast-feeding. Do not use if you have a known allergy/hypersensitivity to blue-green algae species or any of their constituents.